Gold panner finds 559-gram gold nugget in Tuolumne Co.
TUOLUMNE CO., Calif. (KGO) -- A man who turned gold panning into a profession hit pay dirt in Tuolumne County last week. 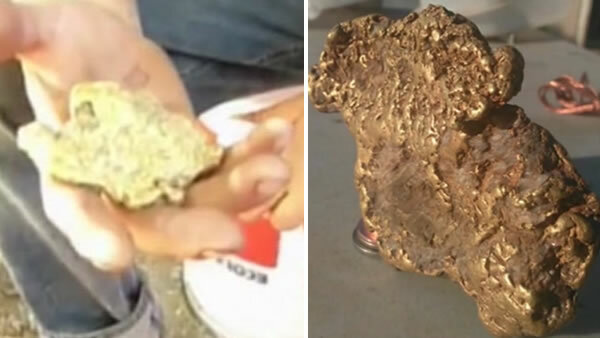 At 559 grams, the nugget is worth an estimated $2,000. "When I grabbed it, my hand kind of slipped off of it. That's when I realized it was a lot bigger than a little nugget," he said. Espinoza says unemployment has led him to turn gold panning from a hobby into a full-time gig. He says his latest discovery will help cover bills in the next few weeks.